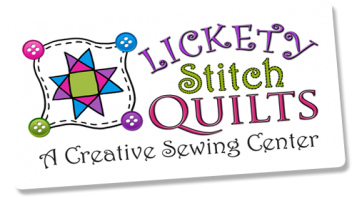 Newsletters of the current and past happenings at Lickety Stitch Quilts. August 15, 2018 - 2 days only - $4 and $5 fabric, free patterns. October 19, 2017 - Only 9 days til our Free Brunch!! August 8, 2017 - Love free stuff and fabric sales? July 27, 2017 - Upcoming Stash Bash, Sewing Machine Service Clinic, More! May 13, 2017 - Bursting with news! February 25, 2017 - Feed the Spark! November 17, 2016 - Get Ready for Winter! March 29, 2016 - Tuffet Party, License Plates and more! March 1, 2016 - Sewing Machine Sale, Retreat, and Much More! January 26, 2016 - Farm Girl Vintage Meeting Saturday, 2 p.m.
December 5, 2015 - Gadget Sale! September 29, 2015 - Farm Girl Vintage BOM bonus offer! September 23, 2015 - Sewing Machine Service Clinic, This week's events. August 26, 2015 - SALE AND EVENT SATURDAY, AUGUST 29. August 22, 2015 - See what is new at LSQ! June 29, 2015 - Reopening July 4, 2015!! November 26, 2014 - After Thanksgiving Sale!!! July 18, 2014 - Wyo Bucking Horse Fabric has Arrived! May 2, 2014 - Corrected Ricky Tims Super Quilt Seminar Notice! March 5, 2014 - Ricky Tims Super Quilt Seminar Opportunity! February 27, 2014 - Should you prewash your fabrics before making a quilt? February 12, 2014 - Which Thread is Best for Quilting - Cotton or Polyester? January 21, 2014 - Local Quilt Shop Day, etc. December 16, 2013 - December 17 Stuff My Stocking! December 15, 2013 - December 16 Stuff My Stocking! December 13, 2013 - December 14 Stuff My Stocking! December 12, 2013 - December 13 Stuff My Stocking! December 11, 2013 - December 12 Stuff My Stocking! December 10, 2013 - Corrected Dec 10 Stuff my Stocking - with price! December 5, 2013 - December 6 - Stuff My Stocking! December 4, 2013 - December 5 - Stuff My Stocking! November 30, 2013 - December 2 - Stuff My Stocking! October 4, 2013 - We have cleaned house! December 23, 2012 - Year-End Clearance On-Line Blowout Sale!!! December 23, 2012 - Year-End Clearance Blowout Sale!!! December 15, 2012 - Year-End Clearance Sale at Lickety Stitch!!! December 2, 2012 - Holiday Open House and Storewide Sale! April 7, 2012 - Spring Cleaning Sale! December 28, 2011 - Correction: Year End Blowout Sale Continues! December 28, 2011 - Year End Blowout Sale Continues!